Offshore and Gulfstream fishing is an adventure you will not want to miss this year. The Outer Banks of North Carolina offers some of the best fishing on the Atlantic, and A-Salt Weapon Charters is your first choice to reel them in. To pilot you and your guests to the best fishing, Capt. 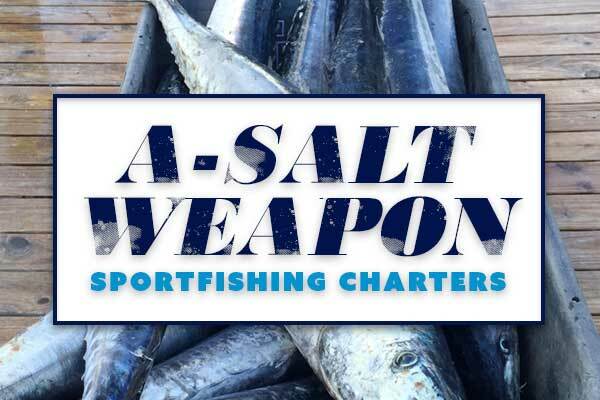 Dennis Endee and the A-Salt Weapon are here to serve your every need on your exclusive charter. We provide you with all the equipment and bait for your trip. All we require from you is the passion to go fishing, and the strong desire to have fun. Summers are spent fishing off the coast of the Outer Banks and winters are spent fishing in warmer climates. Past winters have taken us to the Bahamas! We hope that you will take a few moments to review our website and discover how we can make your next offshore or Gulfstream fishing charter the best ever. Feel free to email us at Asaltweapon54@aol.com for more information. We look forward to having you on board!